In Business Model Innovation, participants will discover new ways to dramatically improve profitability and productivity within their organization, says Academic Director Serguei Netessine. A Systematic Framework: Discover a structured process that eliminates guesswork when designing a business model. Most organizations systematically and rigorously maintain and monitor key metrics such as quarterly financial statements, productivity levels, and market position. But they rarely evaluate their business models as thoroughly, leaving the opportunity to modify and even transform these models untapped. Business Model Innovation in the Digital Age helps participants unlock this potential by developing a process for innovation that can be managed and turned into a driver of growth. Unlike innovation that involves the creation of new products, services, or technologies, this brand of business model innovation can come from anywhere in the company. It requires fewer resources and less time to implement, and can result in innovations that are far more profitable and transformative than product- or technology-driven ones. Embrace Failure: Professor Serguei Netessine says failure is part of the process when innovating a business model. Business Model Innovation in the Digital Age provides a systematic framework that relies on practical management rather than startup agility or luck. You will begin applying this framework to your own business during the program, conducting an audit of your current models and identifying areas for potential innovations. You will also learn a process for experimentation that addresses weaknesses in proposed business models and experiment with those models to quantify their value and viability. Working in small groups, you will apply class learnings to a real company. Because the critical last step in the process is implementation, you will be immersed in a half-day simulation on change leadership, strengthening your ability to get buy-in and drive change in your organization. You and your team will act as consultants to a company going through a change effort, working to successfully sell that effort to those in the organization. This powerful learning experience, a highlight of the program, allows you to apply new approaches, learn from real-time feedback, and hone your skills. 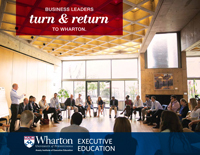 Led by Professor Serguei Netessine, a global thought leader in business model innovation, the program also leverages the expertise of other Wharton faculty who specialize in big data, artificial intelligence, business ecosystems, and digital disruption. In addition, successful business model innovators will share their experience and insights with participants in two highly interactive sessions. By the end of the program, you will have the tools and skills needed to create value in your organization and to better position it in your market and industry. Business Model Audit: Uncover within your organization currently unidentified ways to dramatically improve profitability. 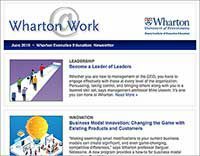 Professor and Vice Dean of Global Initiatives Serguei Netessine talks about Business Model Innovation for the Digital Age on Wharton Business Radio, SiriusXM.